Sanitary cleanable stainless steel process connection, open face flush diaphragm mounted digital display readout pressure gauges. DS201P High Range Flush Pressure Gauge, Switch and Sensor- High pressure sensor, electronic switch and digital gauge with an all welded stainless steel flush diaphragm for high viscosity liquids. Baroli 05P High Range Flush Diaphragm Digital Pressure Gauge- Battery powered pressure gauge with exposed diaphragm for measuring high pressures of viscous fluids or media which requires high level of cleanliness. Sanitary fittings are used by the food processing, drinks manufacturing, brewing, biotech and pharmaceutical industries. Sanitary process fittings are cleanable and have open smooth surfaces to deter the entrapment of bacteria and process residue. Sanitary process connections are often made of high grade stainless steel such as 316L, which is polished to an Ra grade surface roughness finish to minimise the size of pockets in the material which would encourage the growth of bacteria and mold. A flush diaphragm provides a way to mount a pressure measurement device to ensure the continuity of the inner surface of a process vessel or pipe and keeping crevices and voids to a minimum. Flush face mounted diaphragms prevent the build up of process residue which would prevent the pressure measurement device from functioning correctly, and facilitates the removal of all traces of process residue during the cleaning process. 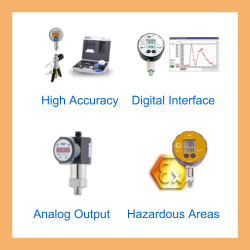 Digital pressure gauges are electronic versions of analogue dial pressure gauges where the dial face and pointer needle have been replaced by either an LED or a LCD digit display. The digital display can be read more easily than the pointer and dial reading, and often with a greater precision. Also there is less risk of damaging the digital electronics of a digital pressure gauge compared to a analog dial gauge, if the pressure gauge is dropped accidentally. The other advantage of digital pressure gauges is many come with extra software features for turning off when not use to conserve battery power, recording highest and lowest readings, and additional pressure units to display pressure reading so you don’t have to use a pressure unit converter. Send us your enquiry for Sanitary Process Fitting Flush Diaphragm Digital Pressure Gauges to get assistance with this product type.